The backpacking lifestyle has always appealed to me, María José, and my husband Javier. The fact that Javier uses a wheelchair (he’s quadriplegic with a complete lesion of C5-C6) has never stopped us from travelling and staying in hostels. Having been on many shorter trips together, on the 30th July 2018, we set off on a three and a half month backpacking adventure. Bali, Japan, Turkey, Israel and Greece were among the stops we made along the way. To manage our budget, we opted to stay in hostels: some with bunk beds, some only accessible by steps and others in remote locations not usually recommended for wheelchair users. Of course, we faced the odd challenge along the way, but overall, we found it a manageable and enjoyable way to travel! We had such an incredible experience that we want to encourage everyone with any form of disability to get out and meet the world, without needing a large group of travel companions or a huge budget. Getting around is easy if you plan a route that works for you and ask for help from the people you meet along the way. We came to realise that everyone’s happy to lend a hand, and with their help, we were able to get to unimaginable places! So here are our top tips for travelling in a wheelchair. Before you do anything else, your wheelchair is going to need a preliminary maintenance check-up. It’s important to check the brakes, tires, reversing camera, front wheel bearings and brackets. The longer you plan to spend travelling, the better prepared you’ll need to be. As we were travelling for three months, we bought new wheels (Schwalbe Marathon Plus) and packed a couple of spare inner tubes and some extra front wheel bearings and brackets. We also needed a toolkit with a set of allen keys and some pliers. Work out which tools are most important for your wheelchair and make sure they come along for the adventure with you. You might also want to pack a small amount of lubricating grease, to keep the axles and bearings turning smoothly, especially if you plan on taking the wheelchair somewhere with a high humidity or over wet, muddy or sandy terrain. Javier uses a manual wheelchair, so on our trip, we needed a SmartDrive device (a motor that attaches to the back of the wheelchair). If you already have one, make sure it’s still in good condition; you’re going to need it every day! 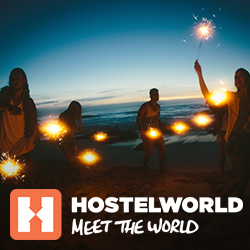 When looking through Hostelworld’s accommodation options, make sure to pick a hostel with a lift or ground-floor dorms. Sometimes the most wheelchair-friendly options will be outside your budget, in which case you’ll need to research how feasible the more affordable options are for you. You can do this by checking the hostel’s layout in online photos or by contacting the hostel directly (by phone, mail or Facebook). We stayed in shared-room hostels in Tokyo (Anne Hostel Yokozuna), Istanbul (Bunk Hostel), Jerusalem, and Barcelona (St Christopher’s). Hostel dorms aren’t always spacious and privacy can be hard to come by, so you’ll have to use your nous and get creative! Firstly, aim to select a dorm with as few beds as possible: ideally no more than eight, but sometimes you’ll have to go up to twelve. The fewer people you’re sharing a room with, the more privacy you’ll have. When reserving the room, remember to let the hostel know you’re a wheelchair user and that you’ll need a bottom bunk. Another important factor to consider while booking is whether the beds have curtains. If this is not an option, you can make your own by hanging the bedspread and a towel around the side of the bed to give you some privacy. Our hostels in Tokyo and Barcelona had beds with privacy curtains, which made life a little easier for us. We’ve been asked a lot about how we went about using the bathroom on our travels. If you’re a wheelchair user travelling on a limited budget, you’ll need to be prepared to make a few sacrifices. Expect to shower a little less often, to use public toilets and to brush your teeth away from a bathroom. A lot of accommodation is not equipped with accessible facilities, so be prepared to look for alternatives. We sometimes had to make use of the airport, train and shopping mall toilets. If we spent several days in a row staying in places that didn’t have accessible bathrooms, we would splash out a little for a day and stay somewhere that did. On our trip, we were carrying all our luggage between the two of us. As we were travelling for three and a half months, we took two large backpacks and a smaller day bag. Javier had the 65L backpack attached to his wheelchair and the day bag on his legs. When doing this, it’s important to make sure that the latter is heavy enough to compensate the weight of the rear pack or you risk the wheelchair tipping back. The advantage of a wheelchair is that it can take a lot of weight without generally affecting how easily you can get around. That said, always take note of the ground surface conditions and watch your front wheels when covering rough and uneven terrain. I carried the 40L backpack, as it was important to keep both my hands-free to help move the wheelchair. When we travel with two wheelchairs, I keep my pack on the seat of the spare one while pushing it, which means the wheelchair user needs to be able to move independently. Accessibility standards varied enormously throughout our travels. In urban areas with well-designed pavements and kerb ramps, we had no problem moving around. But you should also be prepared for places with narrow pavements, uneven surfaces and no kerb ramps. Not to mention obstacles like trees, posts and streets with no pavement at all! – Go down slopes on two wheels, facing forwards. – Go down very steep slopes backwards. The wheelchair user’s companion should keep their arms completely straight so that their legs take the weight, not their arms or back. This way the wheelchair user avoids facing downhill, so they’re less at risk of falling out., plus, they can help steady the wheelchair’s weight by applying the brakes. – Go over potholes on two wheels. – Go down kerb ramps backwards on four wheels. – When the path became too challenging for the two of us to tackle it alone, we would ask a third person for help. There were times during our trip when there was not accessible public transport to all of the sites that we wanted to see. This happened in Bali, Crete and Sicily, so on these occasions, we decided to hire a car. Have a good look through your options on Google and don’t just take the first offer – we ended up hiring a car for 3€ in Sicily! We’ve ranked the countries and cities we spent time in according to accessibility for wheelchair users. The winners for us were Barcelona (the only Spanish city we visited) and Japan, notably Tokyo and Kyoto, with infrastructure becoming more basic, the further away we travelled from the larger cities. – Impeccable airports, with excellent care for wheelchair users. – Accessible public and restaurant bathrooms. – Wheelchair-friendly public transport: lifts at Metro stations, accessible taxis, etc. The places we found to be average in terms of accessibility were Crete, Sicily and Jerusalem. – Limited public bathroom facilities. – Pavements in decent condition in most places. – Little in the way of wheelchair-friendly public transport in Crete and Sicily. Crete had accessible inter-city buses, but nothing else. Sicily only had a handful of accessible trains in Palermo. Jerusalem, however, had 100% accessible public transport. We found cities in Egypt, Bali and Turkey to be poorly suited for wheelchair users’ needs, with low accessibility standards. – Airport staff lacking in wheelchair training – they often had no idea what to do. In Indonesia, we were forced to climb the plane stairs as there was no lift. – No disabled-friendly public toilets. – Pavements were narrow or in poor condition generally, meaning we tended to walk on the road. – No wheelchair-friendly public transport in Egypt or Bali. However, in Turkey, we were able to access the Metro and ferry. So, as you can see, accessibility standards vary hugely from one destination to the next. Accessible infrastructure was not an important factor for us when picking where to travel, but we appreciate that this might not be the case for other travellers. Despite this, it’s important to always remember to be informed about each destination before you get there and to plan ahead. We hope that we’ve given you a good idea of what it’s like to go backpacking in a wheelchair! Where there’s a will, there’s a way, so get out there and travel – even if you’re on a low budget – people are always happy to help! María José and Javier, a wheelchair user, spend their time travelling the world on a tight budget, staying in shared rooms and getting around on public transport. They keep a blog, which has inspired a whole ton of people to get to know the world and people all over it. Follow their adventures on Instagram! The post Travelling in a wheelchair appeared first on Hostelworld Blog.